Imagine waking up to the sound of the waves crashing right outside your window. Residents of 3550 South Ocean will soon live that fantasy. 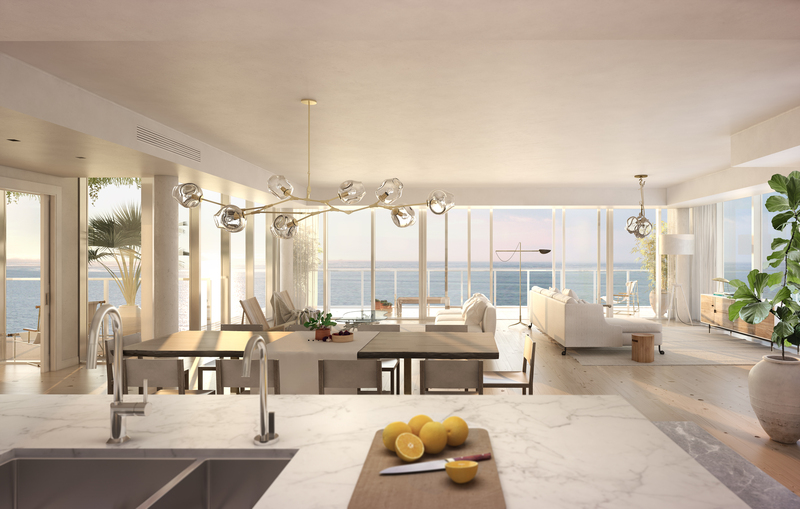 After more than a decade of zero new real estate being built on the Palm Beach Island shoreline, construction has officially broken ground on the luxury condominium, which is already 20-percent sold. The layout of each home ranges from 2,700 – 3,000 plus square feet, and all have direct elevator access, private foyers, private balconies and direct water views. Five penthouses offer private rooftops. Three-bedroom, three-and-a-half-bath penthouses start at $1.875 million. The trademark of this development is the blurred line between indoor and outdoor living. Walls of glass windows, open living rooms and spacious balconies allow residents to soak in the natural light and fresh ocean breezes. The residential interiors include chef- caliber kitchens featuring intricate stonework and solid oak flooring. 3550 South Ocean is being developed, built, and managed by DDG, an award-winning integrated real estate development firm known for its progressive design aesthetic and successful residential buildings in California and New York. The firm has owned, designed, constructed, managed and developed over 2.2 million square feet from coast to coast. A curated selection of amenities are exclusively offered to the expected residents such as private beach access, a beachfront saltwater swimming pool and sun terrace, a fitness studio, on-site surfboard and paddleboard storage, private gated access and private parking. DDG has also partnered with The Wright Fit, to provide residents with at-home massages, private training sessions, yoga and youth fitness and Star Jets International jet services.